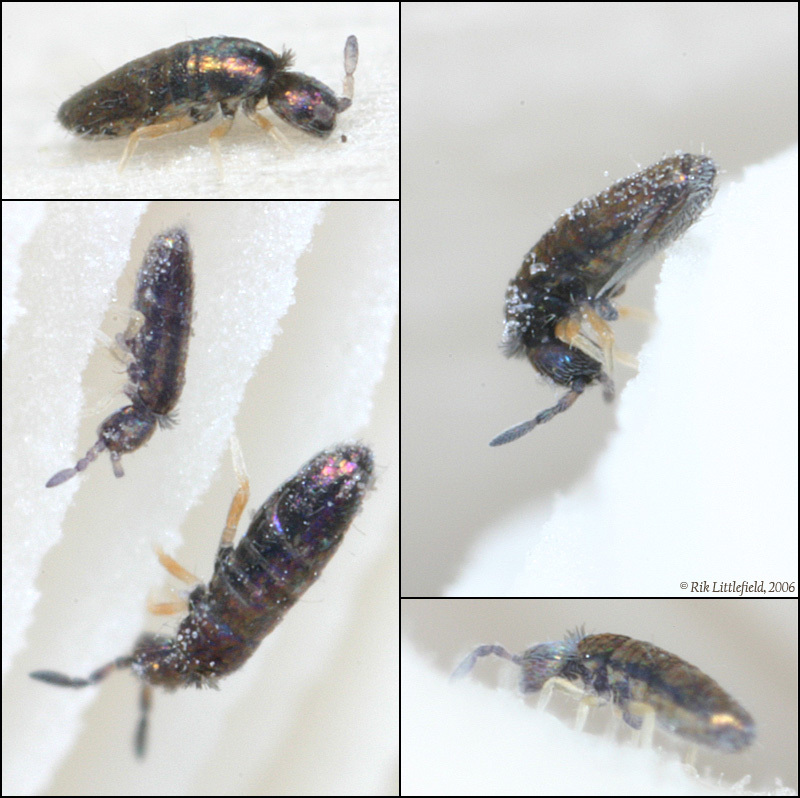 www.photomacrography.net :: View topic - My very first springtails! Posted: Thu Sep 28, 2006 10:05 pm Post subject: My very first springtails! But wait! Did I just see something move? Yes, I did! There's a tiny black speck! And another one, and another one! What are those critters?? I reached into my pocket and pulled out the 10X loupe that always lives there. That helped a lot -- with the loupe I could clearly count six legs. Insects! Yes!! But what kind? I didn't recognize these critters. I thought at first that they looked like tiny rove beetles. But I couldn't make out any elytra. What then? So I set up my trusty 38mm Olympus on lots of bellows at f/8 with electronic flash, brought the mushroom inside, maneuvered it by hand in front of the lens, and clicked the shutter a bunch of times -- basically every time I thought I had something in focus. A few of the pictures seemed helpful, but on a quick look I still wasn't sure. Here's a sampling of them. Canon 300D with Olympus 38mm bellows lens at f/8, electronic flash, live specimens. But how to photograph them? Stack, of course -- but how to hold them? Somehow glue didn't seem appropriate. 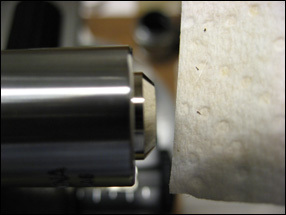 The solution turned out to be a paper towel with dimples. Stable to 30 degrees tilt or so, and no adhesives required. 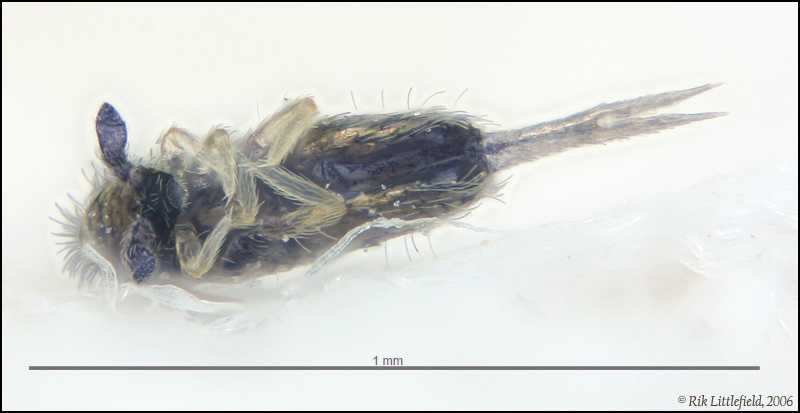 For this picture, I selected a specimen that shows off the furcula (the springy tail). You can also, if you think about it, make out the really quite large groove in the abdomen that the furcula is normally tucked into. And then, just to confirm how everything fits together, you can go look again at the upper right picture in the first montage, which (I now see) shows the furcula in its normal position in a live specimen. Canon 300D with 10X NA 0.25 objective on 150mm bellows, halogen fiber with pingpong ball, stacked at 0.00033". Reproduced here at about 200X. Not what I'd call wonderfully esthetic results, but maybe you'll find them interesting. I did! Update 10/7/2012: See http://www.photomacrography.net/forum/viewtopic.php?t=18359 for a stereo rendering of this subject. Wow! 1 mm? Uhmmm... if I buy Raynox conversion macro/close-up lens I could reach 3.5 mm field width or 12X magnification, compared to my Olympus C-770 UZ camera's max. wideangle macro image size..
Ohhhhh I fell in love with Sigma SD14! Very very interesting Rik. I love the metallic color and the hairy necks on these guys. I can clearly see the tail in the upper right springtail. Very nice pictures..I wonder if they are covered with mushroom spores? I wonder if they are covered with mushroom spores? I think so. I didn't notice those white specks either, until after I had posted the pictures, but I can't imagine what else they could be. The only thing I had done by that time was to pluck the mushroom, carry it inside, and roll it over and over a few times trying to find a bug and get it focused. Yeah, kind of hard to see much detail with the unaided eye. After I was done posting last night, I walked away from my gear. When I walked back, I had to giggle at the appearance of my kitchen table. Somehow it struck me as a bit incongruous. Oh well, it takes what it takes, I guess! WOW what a setup Rik. You are using an objective on the front on the bellows I wonder if I could make an adaptor for my camera and use the objective instead of the Diopter 250D lens Boy those springtails are small There is no lens on your camera Right? Sorry, but it won't work. Sticking a microscope objective in front of your camera will vignette way too much to be useful. To make it work, you would need another "relay lens" to refocus the light from the objective so that it all goes through the camera's aperture and lights up the whole sensor. That's what happens when you stick your camera over the eyepiece of a microscope -- the eyepiece acts as a relay lens. For that matter, it's what happens when you stick your own eye over the eyepiece of a microscope. If you've ever pulled the eyepiece off a microscope and looked straight down the tube, you've got a pretty good idea of how badly your camera would vignette. You're right, there's no lens on my camera other than the objective. This is not quite how the objective is designed to be used, but it's close enough to get pretty good results. All I'm really missing is whatever correction might have been provided by a matched eyepiece. I've tried shooting through the eyepiece (with other cameras), but given the equipment at hand, I get a lot better results from the minimal approach that just sticks the objective in front of the DSLR sensor. It'd be fun to play with an outfit like Charlie's that has really good optics, optimized for the job, but I'm not quite ready to make that investment yet. Ouch! Who knows how many bugs are on me right now! Probably quite a bunch, Nikola -- see http://en.wikipedia.org/wiki/Demodex_mite. An estimated 96-98% of all people carry such mites - with up to 25 in each follicle, each person can have a potentially huge population of mites. Kinda cute little critters, actually. I especially like the idea of them climbing up out of my hair follicles at night and crawling around on my skin looking for mates. I especially like the idea of them climbing up out of my hair follicles at night and crawling around on my skin looking for mates. So that is what keeps me awake at night sometimes. Mites with raging hormones. Wow superb shots of these cool mini beasts! Yet another superb TV series! Hmm, looks like I never bought that copy of "Life in the Undergrowth" that I had bookmarked... Thanks for reminding me. The yield on these pics was about 10% -- 43 shots to get the four that I pasted up into that montage. Almost all the others were completely useless. Fortunately the critters stopped periodically, though briefly. If they had kept moving all the time, the task would have been hopeless, since their full running speed is something like 50 DOF's per second.